The Sky Grand Prix of Aerobatics takes place on the 28 May at Greyville racecourse. The Aerobatic spectacle is warming up with local flyers hoping to dominate the competition. With the picturesque Royal Durban Golf course as the setting and the Berea Skyline and Greyville Race course the amphitheatre, the action is sure to be red hot and scintillating come 28 May. Two Pilots that competed in the last event held in Durban are Patrick Davidson Eastern Cape and Mark Hensman Western Cape. 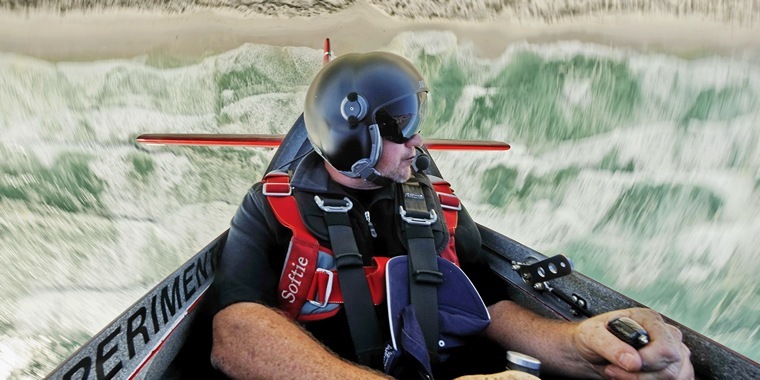 Port Elizabeth based pilot Patrick Davidson is amped for the upcoming event of which he placed second in 2014. "One of my highlights for 2014 was flying at the Sky Grand Prix alongside some of the best pilots in the world. Greyville racecourse is such an unique venue and I believe that it is only going to be bigger and better this year, I cannot wait to get into the sky and have some fun!" comments Patrick who has been flying competitive aerobatics for nearly 10 years and has attained a number of titles along the way. Patrick goes on to say "I will be flying a 1999 Sukhoi SU31, fitted with a 400HP radial engine Russian built machine! I hear that the course will be very tight which should suit the SUKHOI as it operates very well at slow speed and is able to do high G turns with little sign of wing stall, even though it will not be the fastest plane at the event, it should pose tough competition to the others. The figures we will be flying in the 'race' are given to us, so nothing seen here will be 'out there' but the freestyle event will give us some time to play with the boundaries of the aircraft, the SUK likes the gyroscopic manoeuvres due to its massive prop and big control surface areas, I am sure they will some awesome things done by all the aircraft at the event." Cape Town's Mark Hensman is hoping for a podium finish at this year's event but would be satisfied to end up somewhere in the middle of this jaw dropping pack of experienced pilots that will be participating. The Sky Grand Prix takes place at Greyville Racecourse over the skies of Royal Durban Golf Club on the 28th May. Another Coastal competitor is Mark Hensman from Cape Town. "I'm really looking forward to the SGP event at Greyville. I was a competitor in 2014 when it was first held at the Durban beachfront. It was truly the best aviation event I've ever experienced in South Africa. I've participated in several similar events internationally and this is definitely something to rival the best. A podium finish is definitely my goal although I'd be satisfied to end up somewhere in the middle of this pack considering the awesomeness of the pilots that will be participating. My training and preparation will include some focus on wind management. 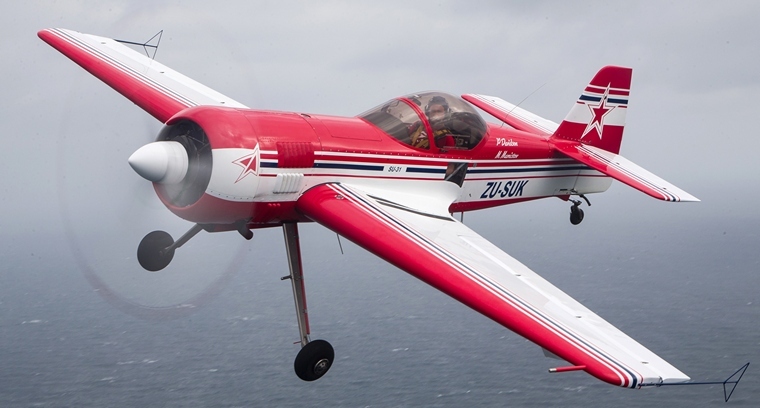 Normally in conventional aerobatic contests, the competitors fly in a space that allows the aircraft some leeway to drift across the display line with the wind. SGP beacons on the ground fix the line. This forces the pilots to stay precisely on a line. Any visible changes in pitch, roll or yaw attitude will earn a downgrade from the judges, so if there is a significant crosswind on the day, the real skill will be shown by the pilots who are able to stay on the line using only corrections that cannot be seen by the judges. I'll be flying my MX2, the main advantage being that it's my plane. I've had 8 years to bond with and learn the aircraft. We work well together. That aside, the relatively high roll rate, power and speed of the MX can be useful in some areas. The low empty weight of 584Kg is also very helpful. It has a 6-cylinder Lycoming engine that left the factory with 260hp, and then was reworked to produce around 320hp. The Hartzell "Claw" propeller does a great job of gripping onto the sky! Anyone with any interest in sport aviation or motorsport in general really shouldn't miss this one." The Sky Grand Prix of Aerobatics is an event that will make South African aviation history. To be a part of this history all you need to do is get on down to Greyville on the day. There will be other activities on the day, which will be advertised in due course. This event will be held in conjunction with the Annual Daily News 2000 horse race. The event is a Federation Aeronautique Internationale (FAI), FAI Aerobatics Commission (CIVA) internationally sanctioned event and is sanctioned locally by the Sport Acrobatic Club (SAC) and the Recreational Aviation Administration of South Africa. (RAASA). This event will be held in conjunction with the Annual Daily News 2000 horse race, The Daily News 2000 Race meeting commences with the first race off at 13:55 and entrance to the races will be FREE from 13:00. The event is supported by - Gold Circle, Royal Durban Golf Club and the Daily News, Sibaya Casino and Entertainment Kingdom and Caesarstone.